This Whirlpool Washing Machine features advanced noise insulation design, so you can enjoy both ideal results and some extra peace and quiet. With its 10kg drum capacity, this Whirlpool Washing Machine provides all the space you need for your laundry. hi, could someone please tell me how to select a spin only cycle? I can't seem to do it without it running a programme first. After finish washing,I switch it off but the water still flow in , isn’t it supposed to cut off automatically?? I would have thought so! Personally I would contact them and ask for an engineer to look at it. Does this machine tumble dry clothes to 'properly' dry? Does this washing machine have a self clean option? Hi there I filled the machine for the first time with half a load on 60 mine cycle with 1200 rpm spin at the end. It’s currently sits in a cupboard under our stair, when it started to spin it was so forceful the machine burst out of our cupboard and was jumping around during the spin cycle. Has this happened to anyone else? No it's not happened to me. Ours is under a kitchen worktop. No, I don't even hear mine spinning, when I first had it, I used to check to see if it was still working as it was so quiet. When the plumber, connected it, did he remove the weights, that are used to transport the machine? We had that problem, it is in the manual, but I did struggle to find it. Tbh at the time I thought it would be easier to learn Swedish! Press the programme button for 3 seconds and turn the knob till you find the settings you want to change, select and confirm. My washing machine isn't auto dosing the detergent & conditioner even though it's selected. The levels in the drawer are increasing instead if decreasing. The Whirlpool FSCR 10432 Supreme Care Washing Machine in White runs at little more than a whisper thanks to our latest Zen technology, so a late night wash won't disturb your sleep. A powerful jet in the drum sprays directly onto your clothes saving water while offering the best rinse performance. For your convenience this washing machine can tumble your clothes after every wash for up to 6 hours after the cycle ends, keeping your clothes smelling and feeling fresh if you aren't available to remove them immediately. 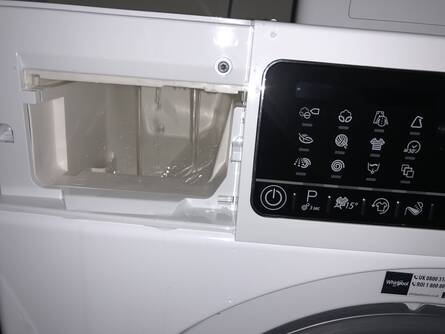 A convenient 15 minute quick wash for 3kg of washing this machine is also perfect for the moments when you need clean clothes quickly as well as intensive rinse for those tough stains. With a dryer that matches this machine perfectly, it is the no.1 in fabric care providing a longer life for your clothes including delicate items. The Whirlpool FSCR 10432 Supreme Care Washing Machine with features for your convenience and a stylish finish to complete any kitchen.